Evans is third in the NFL in receptions. One of them proclaimed. The other one protested. So who do you like in this matchup? 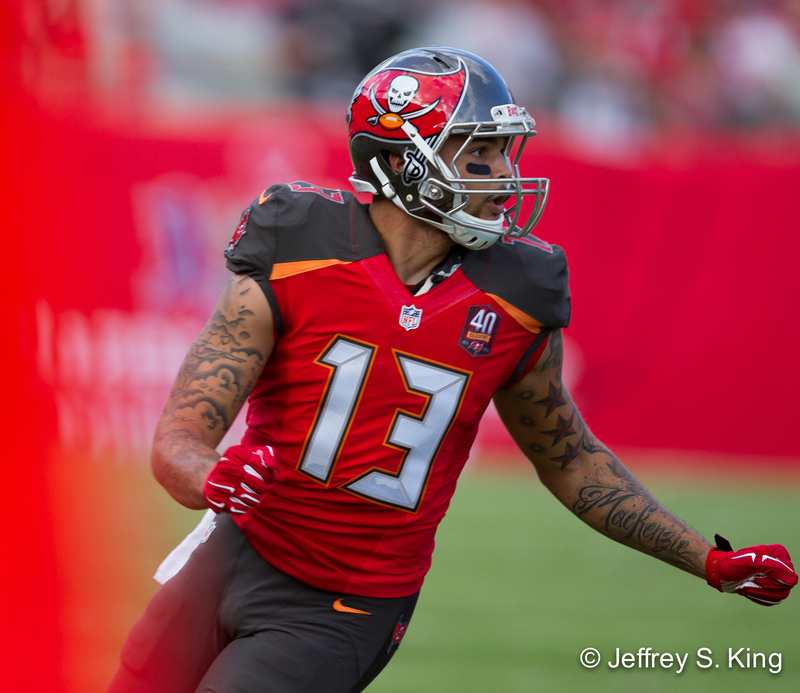 Mike Evans or Richard Sherman. They are men who have been judged harshly by America, men who rubbed the general public the wrong way. They are men who have not been judged by their considerable abilities, but by the noise they have made. They are men who tried to be something greater than an athlete, and in so doing, they came across as something less. Evans will compete against Sherman Sunday afternoon. inaction that silenced his biggest defenders. In the end, all you could say about Evans is that he's 23, and didn't we all do stupid stuff at the age of 23. The other of them, Sherman, dared to rip a beaten opponent, to beat his chest and howl at the moon. His look did not appeal to much of America. His attitude, either. Sunday, we will try to get past the negatives of both men. Sunday, we will watch one of those one-on-one match-ups that can make you look beyond quarterbacks. Evans is third in the NFL in receiving, and he's having a Pro Bowl year. Sherman was recently named as the second-best cornerback in the league. He, too, is headed for the Pro Bowl. And the thing about it: They're both better guys than you might expect. This is the trap we all fall into when we attempt to know someone through a sound bite or a moment from a game. People, by nature, are more complex than that. I spent an hour listening to Sherman at the Super Bowl where the Seahawks throttled the Broncos. I found him bright, engaging, introspective. It was a week after he had ripped San Francisco 49er receiver Michael Crabtree, which much of America found to be a rubbing-it-in move. It was a reminder that the only position in the league that can out-ego a receiver is a cornerback, and Sherman wouldn't let it go. "I think people think I'm a loudmouthed, angry guy who just calls people out," Sherman said that day. "That's the biggest misconception about me. If people took the time to get to know me, they would learn that I'm not that. There is nothing about me that is a thug." Sherman, a fifth-round draft pick, has been golden for Seattle since he arrived. The Seahawks have one of the finest secondaries in the league. He's a part of that. He's also become a voice of the team. That's a part of him, too. "I think image has a good amount to do with it," Sherman said. "If you saw a picture of me, and you didn't have any background information, how would you caption this picture? I think people would pass judgment. "But the discussion has begun. People are trying to get past it and break those walls down. You should try to get to know someone before you pass judgment." Sherman is also a player who graduated from Stanford with a 3.9 GPA. He's a player whose Blanket Coverage charity helps buy clothes and school supplies for children. He is a guy who speaks endlessly about this teammate and that. That day, he regretted what he said about Crabtree. He took something away from his opponent. From his teammates, too. Like a lot of writers, I was prepared not to like Sherman very much. I discovered that I did. I thought he was going to be another athlete who wanted the world to know how wonderful he thought he was. Instead, I found a man capable of self-assessment, a man of perspective. "Race has played a role," Sherman said, talking about the backlash. "It has played a role throughout society, especially right after the game. People had time to contemplate their statements thoroughly and understand the message they were putting out there. I had maybe a minute or two to think about what I had to say right after a big game. I understand the mistakes I made there. But it's hard when people have time to think about it and say some of the things some people did. "I felt they were misguided. I felt sorry for the people who said them. But I also appreciated them. It gave me a chance to mature and grow as a person, to accept the criticism. It was a learning moment for me." Sherman had another learning moment a couple of weeks ago, when he went ballistic on the Seattle sidelines. Most of his teammates shrugged it off. They'd seen it before. Only the fact he plays in the great Northwest has kept Sherman from being even more of a controversial player than he has been. These days, Evans can probably relate. His own protest didn't go where it was aimed, after all. Yes, he opposed Trump. A lot of people did. But he did it on Veteran's Day, which took away from the military. He chose the same manner of Colin Kaepernick, although one protest had nothing to do with another. Evans dropped his protest the way he would have dropped something that burned him. Which, in a way, it did. What do they have in common? Well, youth. Sherman was 25, in his third season when he boasted. Evans is 23, in his third season, when he sat. Sunday, we will watch them play football. Previous post: Did watching the NFL used to be more fun?